There are some animals that dance. There are some animals that dance like men. There are people who dance like animals. There are dances with animal names. Following You Tube videos of a dancing cockatoo, two studies were made on the ability of animals to dance to music. The verdict: some parrots can dance, and maybe even a single elephant. Aniruddh Patel of the Neurosciences Institute in San Diego suggests in 2006 that there is a music link in the brains. The same brain circuits that are used to (learn to) speak, are also responsible for dancing. 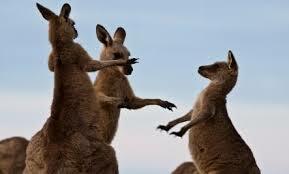 The animals that have an ability to dance, are the animals that can mimic sounds. The possibilities in monkeys and dolphins are not (yet) (sufficiently) studied. A few animals have, without music, their own dance. So we know the bee dance, dancing mosquitoes, the adder dance (and, unfortunately, dancing bears). And for birds and other animals we know the mating dance. Also dancing ferrets dance when they are excited. If they have conquered a toy or have stolen, an object they can perform a kind of war dance. With a waving tail, arched back and hissing they dance around enthusiastically. 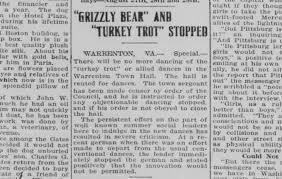 By 1960 there were several dance crazes that were named after an animal. So were there the Horse Trot, Kangaroo Hop, Duck Waddle, Squirrel, Chicken Scratch, Turkey Trot, Camel Walk, The Pony, The Dog, The Chicken, The Bunny Hug, The Monkey and Grizzly Bear. Snake dance can be a parade of dance students in the U.S.. The original Swiss song was "Der Ententanz" (Duck Dance). Sometime in the late 1970s was it named "Vogeltanz" (Bird Dance) or "Vogerltanz". Since 1963 by Werner Thomas as the 'Tchip Tchip' played in restaurants and hotels. During one of Thomas’ performances the Belgian producer Louis Van Rijmenant heard the song. Van Rijmenant crafted it as a co- author under the pen name of Terry Rendall. In 1980, the Dutch band "De Electronica's" released an instrumental version, called "The Birdie Dance / Song." Since then, the number is known by numerous other bird names, in different languages, including "Vogerltanz", "Danse des Canards", "Baile de los Pajaritos", "Chicken Dance" and "Dance Little Bird". More than 370 versions are recorded worldwide, together more than 40 million copies. For some, a catchy, happy tune, for others annoying. But still a hit at parties.